In 2015, we were proud to achieve our goal of hiring 10,000 veterans. Today, we’re even more excited to announce that we’re doubling our military hiring commitment to hire 20,000 veterans by 2020. We’re honored to serve our nation’s veterans as a founding member of the Veteran Jobs Mission and by participating in the White House Joining Forces event where former First Lady Michelle Obama announced the commitment of more than 50 companies to hire veterans and their families. Military experience is great preparation for a successful career at AT&T. Veterans’ leadership, integrity and commitment to service make them outstanding employees. We’re proud to have added 10,000 of these men and women to our team since 2013, and we look forward to hiring another 10,000 by 2020.
in 1945 to use our public telephone center. AT&T is no stranger to supporting our nation’s veterans – we’ve been answering that call for over 70 years. During WWII, we built and ran telephone systems at hundreds of military camps and bases. 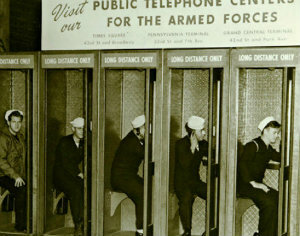 The overseas telephone service, developed by the Bell System, provided instant communication on battlefronts. Now, we continue that mission with support and resources for veterans and their families on the home front – and we wouldn’t have it any other way. It’s no secret – veterans and military spouses make great employees. Their dedication, commitment to their teammates, and sense of pride is unique. Not only do the people around them benefit from this, but so does our company. And we know it – which is why we’re dedicated to helping our veterans succeed. The self-discipline, teamwork, and skills gained through military service make it easy to transition to a civilian career with AT&T because those values are already a part of our culture. Our vast network of veteran employees makes it easy for vets and their families to feel at home and have successful careers. From our transition assistance program to our Veteran Employee Resource Group (ERG) – we’re with you every step of the way. Veterans and their families can find a wealth of support at AT&T and the communities our employees live in. The military develops a sense of pride in what you do – regardless of what the task is. From doing dishes in the mess hall during basic training, to engaging a foreign enemy, everything is done with the goal of being the best you can be. It’s the same at AT&T. Learn more about the life at AT&T for veterans.